It's like an accurate information dating Sim about planes. The information about all the planes mentioned, as well as the pictures of them are all correct. The combat is true to real-life, except for the aliens part, but then they wouldn't have enough plot in this show. The characters have a traumatic past that is teased at and will hopefully see more later, and they don't have too weird or unrealistic of a relationship given the circumstances. And of course my favorite part being that the last girl you meet in the first episode is named after the plane she flies, so I assume the other two will be named similarly. It's like that dating sim where all the girls were tanks. You know the one. Expecting a bunch of humor as well as drama with some cool dogfights in the sky mixed in. This anime is very similar in initial concept to Arpeggio of Blue Steel, but this time with fighter jets instead of warships. Sadly it doesn't have the quality writing that Arpeggio had. In the first episode, a boy running from seemingly invincible enemy fighter jets is saved by a mysterious super jet piloted by a mysterious girl who for dubious reasons immediately connects with him (with a kiss, no less). An artificial girl (a la Arpeggio), who now needs his presence. If you're into this sort of thing, then it's not terrible, as the drawing and animation are fairly good, including the combat sequences. However the entire first episode seemed to be going through the motions in the shallowest possible way. The writing and plot devices were cheap, predictable, and lazy. So while the concept is fine and the production values are better than average, it still barely manages to eek out 3 stars from me just because the story was so overly simplistic. If well written stories were candies, this would be a spoonful of sugar. Sure, it gets the job done, but in the most boring way possible. The second episode consisted mostly of cutesy "boy and girl get to know each other". The following episodes hit many of the cliches you would expect. While they do have a little character development, it doesn't go very far, and leaves most of the main cast in their respective caricatures. There's some entertainment to be had, but don't go in with high expectations. It always makes me cringe whenever I see people review something after just 1 episode (and sometimes just part of the first episode.) What the heck can you tell about character development and the direction it will take (and ditto for story and plot) after just 1 episode? But so many omnipotent and know-it-alls will give you their very uninformed opinions after viewing just a few minutes of a new show. Soooo...3 episodes in and I'll venture the opinion that this anime grows on you. (Something that those 1 episode reviewers don't give it a chance to do.) Personalities and characters grow and develop. The story and plot branches and expands. You begin to care about the characters, something you can't possibly do when you know nothing abut them, and you get pulled into the story. Yes, people, there is a story. It's not just fighter jets and dogfights. Give this one a try. As some of the previous post have mentioned and most have been negative, the anime does conform to a genre of anime from the past, boy meets girl, girl isn't normal, mechs, ships, now planes, all as I've seen in the past. However, I loved all the those that Came before it. Even watching this, I knew what was going to be for the first episode so for me, I'm going to watch it completely. I did find part of it funny and interested in the mystery of the enemy and where they came from. They kinda reminded me of the enemy from Strike Witches also. I gave it a good rating cause I know what to expect from this anime so watch it with me! Interesting Anime for fans of aerial combat. First off, I waited to see how this would go. So far through 4 episodes I am not disappointed. Then again, I consider myself rather biased. I have always loved fighter aircraft ranging from WW1 through present day modern fighters. If I would consider myself disappointed at all, it would be that there isn't an F-16. I can understand why most would call it cliche, but it sparks my interest due to the relationship between the two main characters. The art and music are also fantastic. This is rather full of stereotypical character models, but it still tugs at me. I cannot really say why, but it is definitely worth watching. Sorry for the crappy review, but I find myself really enjoying this series and am expecting a few twists and turns in the plot that may very well break it from cliche. I usually hate anime with mechs and planes like this, but the first episode wasn't bad. The scenes where they're fighting in the air are really good and the story also doesn't seem all that terrible. I kind of feel like this is Powerpuff Girls meets anime and planes. I find myself really enjoying this series. I was hesitant to give it a try, but now I’m intrigued by the direction this story will progress. There are still innumerable unknowns for this series to move. The evolution of Gripen and Kei is a joy to behold. I love the innocence Gripen portrays with the depth of her sincerity towards Kei. She is a real treasure already. Please continue this Kawaii story. I'm really sad to see so many negative reviews. I'm a huge fan of Arpeggio of blue steel and it's life ended prematurely. Looks like the same will happen with this one. There are only four episodes of this at the time of this writing, and I'm hooked! I like the main character's story and his passion for flying. And I'm in love with how the writers are tying that passion in to the story! And as another reviewer mentioned, the attention to detail is very appealing and much appreciated. I look forward to to each new episode! This is an amazing Anime, I really hope you keep making this. I really like the art style and the way the story is, I hope to meet the other characters soon and I hope there is a lot more action and fighting coming soon. Keep up the good work and produce more of this anime because I feel more people would like it. Interesting and refreshing. Episodes 1 - 6 currently. This series definitely has its charming factors, with all the character flaws and humorous situations. Give the series a chance, don't dismiss it entirely on the first episode. This series is pure goodness along the lines of Arpeggio of Blue Steel, and Darling in the Franxx. If all the characters were perfect flawless Top Aces, this series would/could get boring quickly, and adding in Kei wouldn't make any sense at all as Gripen's co-pilot. The Anima's are advanced artificial A.I's in human styled bodies linked to highly advanced fighter jets. The 3 Anima pilots - Gripen, Eagle, and Phantom have yet to recognize the value of teamwork, still at odds with one another when on the ground (Eagle boasting her skills over Gripen, Phantom putting both Gripen and Eagle to shame in their last mock air combat), with Kei caught in the middle as they all seem to like him at least for one reason or another. So, let's start with Gripen, the pink haired Anima, witha red fighter jet. She's got issues - staying awake, self confidence to start naming a few, not to mention lacking in physical appearance or so she's been told. I doubt the creation of Anima's are 100% perfect and flawless all the time. Whatever and everything she's been lacking, Kei's presence has been helping her. Could be as simple as friendship and a confidence boost. By the same token, requiring Kei to be flying along with her is a conundrum in itself. Without Kei, Gripen has trouble performing entirely, with Kei, she has to be careful while performing combat maneuvers since Kei's human and humans can only withstand X amount of G-forces. Eagle - American blonde with a gold colored fighter jet (and probably fits the Barbie callsign the best), she's a polar contrast to Gripen, very skilled, confident and overly cocky, doesn't hesitate to rub it in Gripen's face either. Also doesn't take well to losing when Phantom handed it right back to her in mock air combat, she's possibly much more fragile than she lets on or thinks. At least by episode 6, she's learning to be a team mate with Gripen. Phantom's yet a mystery. Green dyed hair, pilots a green colored fighter jet. She's got some extra skills that'll give them an edge in upcoming combat - assuming she gets around to make use of them. Biggest thing with Phantom is right now it's hard to tell whether she's entirely become about self-preservation above all else or she truly has a superiority complex. Or does she know more than she's letting on about? Shes deceptive and not above cheating. It might present more issues for the team. 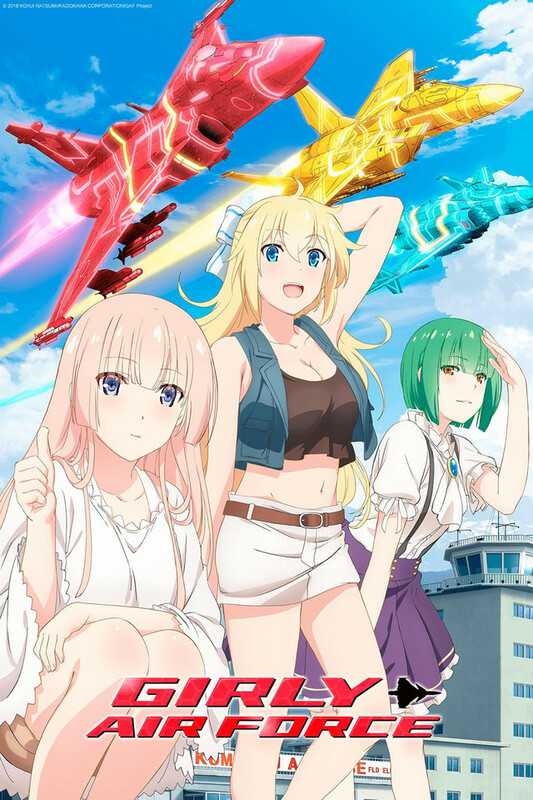 Kei - human male teenager, who gets caught up in the middle of everything, for wanting to join the air force to become a fighter pilot ends up getting himself recruited as a co-pilot to Gripen. he's tasked with helping Gripen overcome her issues and shortcomings, and teaching her more about humanity just by the daily interaction with her. Kei being the typical male proper and unassuming teenager finds himself in no shortage of awkward moments while in the company of Gripen, Eagle and Phantom. Minghua - human female teenager, possibly a bit older than Kei. Friends with Kei since childhood. With having lost her parents, Kei's practically the only person she has left in her life. She does her best to look out for Kei, also doing the housekeeping and chores of his grandparents house they're staying at, whom is for some reason entirely absent. She's not happy about Kei's role in the airforce, and less happy when any of the 3 female pilots show up. During the slow times in the episode when there isn't a combat mission going on, we get to see Kei trying to have a semblance of normal life at his grandparent's home with Minghua, his childhood friend. That is, when he's not spending time with Gripen, teaching her what its like and means to be human. Minghua has no love at all for the female fighter pilots, and a possible jealousy when they show up and intrude on during her time spent with Kei or Kei gets called and goes racing off to the base on a moment's notice.